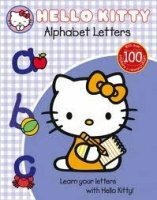 Join Hello Kitty as she shows your child a simple way to learn the alphabet and develop early years literacy skills through lots of fun activities. Content is written by an education expert and linked to the Early Years Foundation Stage. With lots of reward stickers included, Hello Kitty makes learning fun!